Will Vietnam Rise to Its Challenge? Topong Kulkhanchit of Disabled People's International is a tireless advocate for justice. His travels through Asia are extensive. He was one of tne of the organizers of the 2004 Taipei conference on accessible travel and the 2006 international conference on peace through tourism in Thailand. He is the lead organizer for the 2007 follow-up to the Taipei conference to be held in Phuket, Thailand. Below Topong circulates an open letter to his colleagues in Vietnam urging adoption of Universal Design, as incorporated in numerous UN and regional documents, in upcoming infrastructure and major public works projects. Continue reading Trang web cá cược trực tuyếnWill Vietnam Rise to Its Challenge?. Connecting Ability and Disability in AEGEE launched the Bridge project in Wroclaw.The event, "The disabled and the facilitator - a complex relationship", took place on 14-17 April 2005 with the support and participation of a number of people with different disabilities, and disabled people's organisations. Continue reading An EU Culture of Mobility. In New Jersey this weekend and looking for a wheelchair accessible park and an outdoor concert? Blues harmonica player James Cotton plays at Duke Island Park this Sunday. There's no indication that the event will be sign language interpretted but you can read, hear, and see video snippets of the process at one of Paul Simon's concerts. The story is at NPR. He also picked up a good story about a Boy Scout's good deed and an interview with Jeanne Amendola who was just appointed to the board of the Able Trust. Tom Chun, northern Californian, scuba diver, wheeler, and now "International Man of Leisure", checks in from his around the world tour. Continue reading With Tom Chun on the Grand Tour. Coconut Point Park, 3535 SR A1A, south of Melbourne Beach. Continue reading Florida's Space Coast: Indiatlantic. Candy Harrington at Emerging Horizons is often first to break important stories related to inclusive travel and accessibility. Even when she's not she does an excellent job of digging deeper than most people. Her July 19 post, Air Asia Discriminates?, delves into the latest case of airline industry nosediving on accessibility. Gerald Ensley, Senior Writer for the Tallahasee Democrat, has a story to tell as a Temporarily Able Bodied person (TAB) who has crossed-over. It was a vivid lesson in how necessary those accommodations must be to people with disabilities - and a reminder that all of us are just an unexpected injury away from needing them ourselves. Continue reading Crossing Over - and Landing in the ADA's Safety Net. Vasi's Site is Up & Going - and So is He! On July 7 I mentioned Vasile Stoica's trek and his site. His site is now up -- and looking very good! Continue reading Vasi's Site is Up & Going - and So is He!. Your comments are needed by July 28, 2006 - this is a new extended deadline -- on important proposed changes to the Americans with Disabilities Act (ADA) transportation regulations. * Should transit agencies be required to make reasonable modifications of policies, practices, and procedures in order to avoid discrimination, such as when providing ADA paratransit to individuals who need assistance beyond the vehicle to reach the facility door? It appears that some transit agencies have responded to this proposed change by ALREADY stopping service to paratransit riders beyond the vehicle (that is, no assistance to or from the building). If this is true where you live, submit a comment to let DOT know. Also tell DOT if you or people you know would be unable to use the ADA paratransit service, if this type of assistance was not available. * Should rail systems provide full platform access? * Should DOT use a Department-wide coordinated approach to interpreting disability policy questions? * Should transportation providers that acquire used vehicles be required to make efforts to obtain accessible vehicles? * Is there a problem with the exclusion of wheelchairs that transportation providers say do not meet the "common wheelchair" description? The Canadian Paraplegic Association maintians a helpful website. One portion is a good listing of inclusive travel destinations and services. Here is a link to a recent piece on van rental in Nova Scotia. Below is the text of a draft Code of Practice developed by the Canadian Transportation Agency dealing with terminal accessibility for persons who travel in Canada by air, rail or ferry. Public comment is requested until July 28. Continue reading Canparaplegia: Promoting Accessible Travel Options. Here is a European lodging resource put together by the Swiss Federation of the Blind and Visually Impaired. "We intend to adapt ourselves every day," explains Ana Montesdeoca director of El Hotel Dorado Beach, en Arguineguín, Canary Islands. With an annual occupancy of 500 vacationers with disabilities and the support of inclusive travel advocates like Spain's Fundación ONCE we can believe that she means what she says. To which we say, "Muchisimas gracias!" Continue reading The Canary Islands: El Hotel Dorado Beach. Travel information became much easier to find with the advent of the web. Google is making it even easier with Google Accessible Search. Leave it to T. V. Rahman to keep pushing digital frontiers for our community! The war in Iraq is sending home injured soldiers who may represent a future wave of elite disabled athletes. Injured troops are given sports training as soon as possible. The military and medical communities believe sports not only rebuilds confidence, but also pushes injured veterans to re-learn physical skills that war took away from them. A quick Google locates stories illustrating the breadth of activity involving travel and recreational activities that this niche is involved in. Continue reading The Disabled Vet Factor -- Setting Trends for Inclusion. Sticks and Wheels.com tells you aboutthe book of the same name on accessible adventures in British Columbia. The site also had a note about Hidden Grove Legacy in Sandyhook is building an accessible trail to old growth forest. The summer 2006 IDEA Center E-Newsletter is now available. Vera Cruz, Mexico was the site of the 7th National Conference of the Tourism for All Network of Mexico. The reports are here. "Hail Mary full of grace, help me find a parking space!" goes the old bit of Catholic humor. 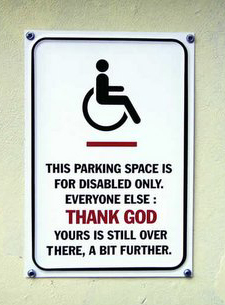 This sign, brought to our attention by Penny Richards at Temple University's Disability Studies Blog makes you wonder if being first is all its cracked up to be. Continue reading Advertising with a Crip Culture Edge. The author of Blindpople Blog has a posted a request for tips about travel. Head on over if you have some helpful hints. To follow other posts at Blindpeople look at the main page here. Trapped: Rescued from a Reclining Seat at 30,000 Feet! Don Norman is a hero to many of us who work in Human Computer Interfaces and design in general. So, it was particularly interesting to find some of his writing had shaded into a topic that is often covered in the Rolling Rains Report -- airplane passenger cabin design. Kudos to Lufthansa for wonderful flight attendants, for a marvelous meal and for trying so hard to make seats that truly deliver. If it is the thought that counts, Lufthansa wins. If execution also matters, well, they need to call in the human-centered design experts. The Abilities Fund - An Opportunity to Develop Inclusive Tourism Opportunities? Grasping the seven principles of Universal Design is a first step in expanding inclusive, accessible tourism. A first generation of entrepreneurial specialized travel agencies and tour operators set deep roots for inclusive travel and understanding grew. Studies such as "From Anxiety to Access" by Simon Darcy and the regular surveys of Eric Lipp's Open Doors Organization were the first to illuminate relationships between travel industry sectors and the market niche that would travel more is Universal Design were adopted by the hospitality and travel industries. "Entrepreneurship has become a consequence of disability discrimination in the workforce," said John D. Kemp, senior vice president of strategic development for New York City-based HalfthePlanet.com. "Starting your own business is a very viable alternative for people with disabilities. It fits well with the whole notion of turning your third bedroom into a small business." Continue reading The Abilities Fund - An Opportunity to Develop Inclusive Tourism Opportunities?. Boots n All Travel askes the question, " Why go to Bamako, Mali?" Continue reading Being There in Bamako, Mali. Go ahead. Make his day! Visit Cebu on Wheels and see what he has to offer. If you have not yet discoverd the blog at Freewheeling.info you ought to give it a try. Here is a post with some insights on travel in Europe. There is plenty more on the site worth exploring. Take a look. Truckee, California is worth visiting on its own. It is also home to Candace Cable a nine-time gold medal winner in winter and summer Paralympic competition. Looking for a motivational speaker? See her site or these news items. The North Tahoe-Truckee area is home to many extreme athletes who are disabled, including Mark Wellman, who was the first paraplegic to climb El Capitan and the only paraplegic to climb Half Dome. Continue reading Personalities of Note in Truckee, California. Those who followed my recent road trip from peak to peak through the Cascade mountain range know that I have an appreciation for natural beauty. A cruise down the Inside Passage from Alaska in 2004 provided day after day of such beauty but held a partiicularly unexpected pleasure -- getting to know tour guide Terry Breen. It was immediately obvious to my wife and I from the first time Terry came on the ship's loudspeaker narrating a portion of the cruise that we were listening to someone of intelligence, wit, and experience. Meeting her in persn and corresponding with her over the years confirmed that first impression. Continue reading Meet Terry Breen - Cruise Expert. Vasile Stoica is on the Move! Vasile Stoica is on his way to somewhere I'd like to visit -- Finisterra, Galicia. the difference is, he's going by land - by wheelchair actually - from his home country of Romania! Stoica, 36, is the holder of a Guiness Book record for the longest distance in a wheelchair in a day - 128 kilometers. He is also the first to have crossed the U.S. from Los Angeles to Chicago in a wheel chair on the famous Route 66. Suffering from a congenital paraplegia, Stoica, who was born in a poor family with seven children, underwent thirteen surgical operations before he was seven, but his condition didn't change. "I am a normal person and I have no problem with being in a wheel chair except that there are not many facilities for people like us in Romania like they do in other countries," Stoica said on Friday, adding that one of his goals is to raise people's awareness towards handicapped persons. Continue reading Vasile Stoica is on the Move!. "Free2Pee" - Part II ? I'm trying to get word out on a new site I've set up called Worldwide Accessible Washrooms. I'm hoping this page will become a comprehensive list of wheelchair accessible washrooms throughout the world. I came up with the idea on a recent trip to Europe, originally just taking notes for myself, but then thinking that the info could be useful to other travellers or inhabitants of different areas. Please check out http://ca.geocities.com/mcsting@rogers.com/index.html and email me with any additions you may be aware of in your area or in places you have travelled to. There's not much on it now, only some listed in a few cities in Italy and Canada. Hopefully it will grow soon with your help. I'd appreciate any input you can give me. Thanks a lot! The publication of the special forum on travel, disability, and Universal Design in the Review of Disability Studies marks the first sustained look at travel and tourism through the lens of Disability Studies. Below is an abstract of the lead article, "Toward a Global History of Inclusive Travel." The entire work is available the Review of Disability Studies. With the project of a global chronicle of the development of inclusive travel underway through the work of Laurel Van Horn and José Isola I invite Rolling Rains Readers to submit comments, updates, and contributions of their own. Continue reading Toward a Global History of Inclusive Travel. "While the history of accessible travel and tourism is intertwined with the disability rights and independent living movements, sharing their triumphs and setbacks, it has its own landmark events, advocacy organizations, heroes and villains." So begins the first article of volume 2, number 2 of the journal Review of Disability Studies. The piece is entitled, "Toward a Global History of Inclusive Travel", by Laurel Van Horn, M.A. of the Open Doors Organization and by José Isola, President of the Peruvian Polio Society. In my opinion, one of the landmark events in the progress of inclusive travel is RDS' decision to publish this volume. I am proud to have had the opportunity to edit it - and moreso to have been associated with the scholars whose work is the heart of this issue of the Review of Disability Studies. Congratulations to those who researched, wrote (and rewrote) for this first examination of travel, disability, and Universal Design from within the field of Disability Studies! 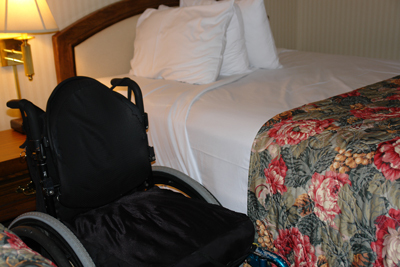 Continue reading The Review of Disability Studies on Tourism Through a Disability Lens. The Alviso Marina on the San Francisco Bay Trail system is not the perfect example of outdoor accessibility. Gaps in planning could be pointed out. What is noteworthy is the way that development was strategically implemented to leverage maximum impact. By starting with a small municipally funded improvement project, regional and finally federal monies were secured to add something valuable to Alviso, California with tangible benefit to the entire Bay Trail system. Hotels: Barrierfrei -- or Nicht? For those who read German, Christianne Link in her Behindertenparkplatz Blog asks an important question, "Wie barrierefrei ist unser Hotel?" - "How barrierfree is our hotel?" For those who would rather follow using Katya Stokeley's translation at Broken Clay Journal try here. It is always a pleasure to share stories of excellent customer service! Continue reading Hotels: Barrierfrei -- or Nicht?. The Patient-Consumer Parade published a blog carnival on the topic, "Why must we be ‘patient’? The blog is here and worth reading if you are not yet a regular there. Excellent critique, Penny. Thank you for engaging the question! Constant vigilance for "medicalization" of disability is a key survival skill for anyone with a disability. As an optic, vigilant monitoring for the inappropriate medical/patient power dynamic cuts to the heart of many problematic public, non-medical social interactions. Sometimes thoroughly understanding and explaining the classic distinction between "handicap" and "disability" is enough. Observing that pseudo-medicalized social relations is a likely cross-cultural power dynamic has made international travel easier on various Rolling Rains trips. The point at which it becomes possible to expose the fallacy of wheelchair users having "permanent and constant patient status" is always a point at which I introduce the concept of Universal Design. The beauty of that intellectual dance step is that Universal Design embodies, in concrete fashion, the heritage of pan-disability culture. The UD concept grew parallel to - and out of the same value base as - the disability rights legislative thrust that gave US citizens section 504 of the Vocational Rehabilitation Act (where the spinal cord injury community, to take one example, learned decisively that it was a major consumer powerhouse) and eventually the Americans with Disabilities Act. To answer your question, you're absolutely correct; using a wheelchair doesn't necessarily make you a "patient". But it does make you a healthcare "consumer," just as using a car makes you an automobile consumer or riding a plane makes you an airline consumer. The purpose of the Patient-Consumer Parade, then, is to bring people together who 1) think of themselves as purely "patients," 2) consider themselves healthcare "consumers," and 3) are someplace in between! "Sailing for Everyone" is the kind of motto that is only possible when folks like Access Dinghies and Socio Engineering Research institute get together. You can find the seven priciples of Universal Design applied to sailing at Access Dinghies. Northern Health Connections provides transportation to medical services. Their territory, northern British Columbia, covers 600,000 square kilometers and includes 300,000 people. What is particularly farsighted about the assisted travel program that they will launch this month is the extent to which they have made their busses accessible. The service will have custom-fitted coaches and buses. All of the new vehicles will be wheelchair accessible. Highway coaches will also have wheelchair accessible washrooms, a first in North America. This region is a beautiful part of Canada. Integrating Universal Design into the regional healthcare system will be a boon to residents -- permanent as well as summer -- and provides a powerful impetus to the local travel & hospitality industry to become inclusive. Continue reading A First in Bus Travel Comes From Canada. Universal Design and barrier free homes used to be reserved for senior housing and nursing homes, but now it's the design trend for the future. So says NBC News in Madison, Wisconsin. It's the right design trend for hotels, motels, and cruise ships too. The Rolling Rains Report occassionally has taken up the topic of clothing and accessories in the context of travel but Wheelchair Dancer has a more thorough discussion in which she muses on Universal Design in fashion as well. Notice also her travelogue on a Wonderful 4th of July Trip. Social inclusion, adventure travel, agroturism, an ecoturism all converge in the tourism economy of Brazil. Below is a report (in Portuguese) on the maturation of this trend. Continue reading Turismo de Aventura para portadores de necessidades especiais. Meet J. L. Chuites, leather sculptor and teacher of the leather arts. Intimate Apparel, The Winter's Tale, and The Importance of Being Earnest were the productions that drew me to Ashland, Oregon and the Oregon Shakespeare Festival - theater (& accessibility) tales for another post. Surprise and paradox abound in Ahsland. Beyond the bear who frequents Lithia Park (who I did not meet) I encountered a deer -- who seemed to be watching the Wendy's longingly from the bushes one morning at breakfast time. 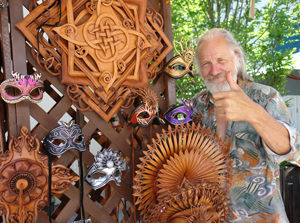 But the unique ecosystem of Ashland is the performing arts and artisan class. Continue reading Artists in Residence. CYPRIOT disabled organisations yesterday welcomed EU legislation that will protect wheelchair users from discrimination when travelling by air. The regulation was adopted by Transport Ministers in Luxembourg on June 9 in an effort to end daily discrimination against disabled passengers by airports and airlines. “This move is an important step, because all airports and airlines will be forced to adhere to obligations regarding disabled travellers, instead of it being up to the sensitivity of each country,” said Dimitris Lambrianides, president of the Cyprus Paraplegics’ Association. From the Oregon Shakespeare Festival Box Office, safely above Lithia Park, the ticket sellers attend to playgoers sometimes offering friendly advice, "Watch out for the bear in Lithia Park." The first time I was here - recently sprung from the hospital by my best friends from high school - the strategy for deterring overnight camping in the creekside park was signs. Now they seem to have turned over enforcement to the forces of nature! We saw no bears. Then again, we did stop meandering the trails of Lithia Park before curfew having experienced the terrifyingly convincing bear growl during the death of Camillo during the matinee performance of "A Winter's Tale" in the Angus Bowman Theater. I wonder where they got that recording? Continue reading Lithia Park Provides Wildlife Adventures. The drive to and up Mt St Helens offers quite a vista. It is a reminder of the awesome power of a volcano to see "matchsticks" laid out like a repeating pattern on the slopes only to discover up close that they are age-bleached trees - some twice as big around as telephone poles - blown down by the blast. 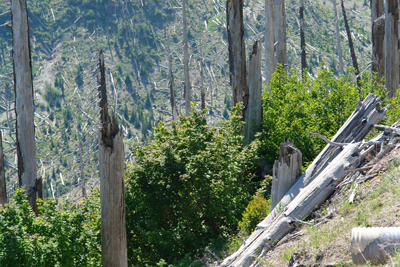 Continue reading Mt St Helens Recovery. After a long drive to Ashland, Oregon for the Oregon Shakespeare Festival lodging is the first order of business -- quickly followed by food. Along the Columbia River Gorge there are plenty of interesting and challenging site for rock climbing. What I didn't expect was that the same techniques would prove useful trying to climb into bed at the Red Lion Inn in Portland. Captivated by the "shoulder-height-bed" craz,e Red Lion on the River is not recommended for folks of short stature, those with difficuty climbing or wheelchair users traveling alone. Continue reading Red Lion Inn, Portland, Oregon.